Today is Good Friday, one day of the Holy Week, and it is the time of the year when many Filipinos, who are mostly religious, take time to do penance or pay for their sins. Sacrifices are done by each person in his or her own little way like going to different churches (known as the “Bisita Iglesia”). 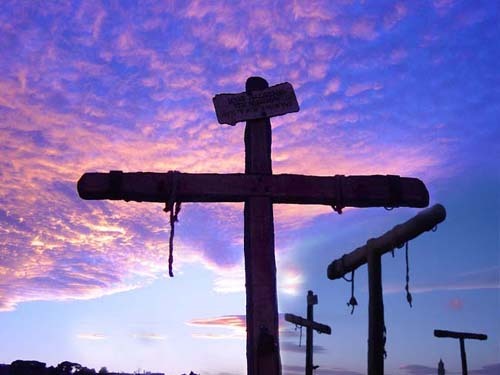 Others practice a different sacrifice by trying to replicate Christ’s passion, carrying their own crosses, some even going to the extent of having themselves nailed to the cross. As a pastor, I see these practices and feel for the people who do them. Many of these people are sincere about finding peace with God because of past sins they have committed. Some honestly think of the grave decisions they have made in life like maybe getting an abortion, leaving a spouse behind but others may think of wrong doings like drinking and smoking Black and Mild and the like. But what does the Bible say about these things? I realize that all of us are on our own spiritual journey and have our own ways of making peace with God, but what does Jesus say about all these? Jesus said in John 14:6, “I am the way and the truth and the life. No one comes to the Father except through Me.” This is a statement where He claims that there is no other way - not religion, not a religious practice, and no other belief system is the way to God but through Him alone. For skeptics, this statement is an arrogant statement. But what about if we take a step back and evaluate Christ’s and the Bible’s claims? For those who already believe in Christ and the Bible, what about re-evaluating what we have done based on tradition and religious practices based on what Christ and the whole Bible says? Below are passages from the Bible about this topic. Take time to read, consider these things and re-evaluate your own spiritual journey. But whose blood sacrifice does God accept? We make peace with God by simply coming to Him and confessing our sins and asking forgiveness and recognizing that He will forgive us because Christ has already paid the only acceptable sacrifice for all man’s sins.